Augurs lead developer, Jack Peterson, gave a preview into our bounty program at his talk during Devcon3 this year. Titled “Missing links in the Ethereum development stack”, Jack went on to discuss how the Ethereum development community is in need of additional public tooling. Four bounties were announced at Devcon3, and now two have been officially scoped out and launched live. These include the “Safe Solidity Solium Rules” and a “Portable Solidity Debugger” for 1,150 REP and 2,000 REP. 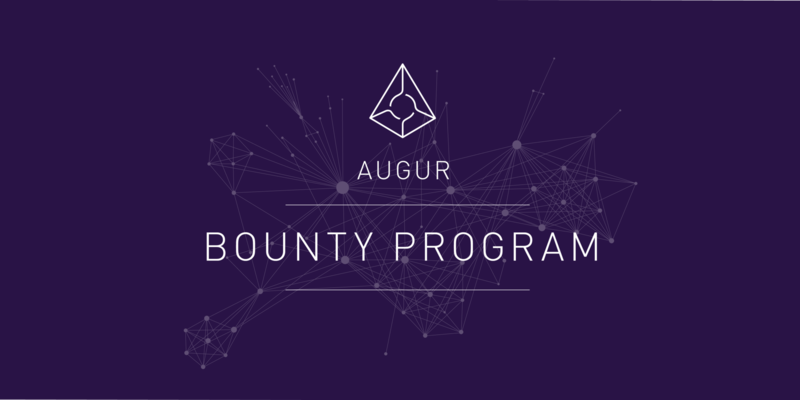 Details for each bounty can be found at augur.net/bounties. We believe these additions to Soliums linting rules will be beneficial to anyone developing with Solidity, as well as having a portable debugger. These bounties can be claimed by anyone, as long as your PR is merged into the main projects repo. Additional bounties will be added to this page over the coming weeks. For questions, comments or concerns, come reach out to us in our Discord.